Boyko Borisov, Bulgaria's Prime Minister has opposed the ancient ritual of dog spinning, which was recently renewed in a southeastern village, declared it barbarian and called for sanctions. 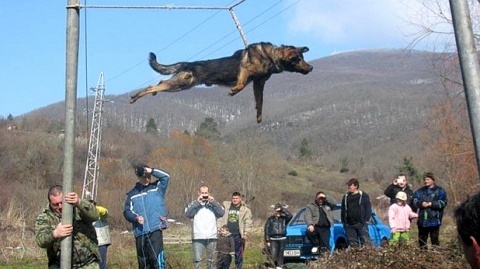 In dog spinning, which is practiced in Brodilovo, a southeastern Bulgarian village, at the beginning of March, a dog is suspended above water on a rope. The dog is turned repeatedly in a given direction to wind the rope, then released so that it spins rapidly in the opposite direction as the rope unwinds, until the dog falls into the water. The locals claim that the dog is not supposed to be physically hurt. This ancient ritual of pagan origin is performed in order to prevent rabies and is a part of the traditional Kukeri rituals. After it was banned by the local authorities in 2006, on Saturday, March 6, the ritual was performed again by Brodilovo. The Prime Minister has discussed the issue with Chief Prosecutor Boris Velchev and both have agreed that the new animal protection law should include sanctions for animal torture. According to the draft law on animal cruelty incrimination, which was accepted by the Parliament on first reading in February, those who injure an animal on purpose will face probation and a fine of BGN 3000. The Mayor of the Tsarevo Municipality, where Brodilovo is located, the southeastern Bulgarian village that has renewed the ancient ritual, however, has stated there is nothing wrong with it. Even though he personally prohibited the tradition in 2005, when the Brodilovo citizens faced sanctions, Mayor Petko Arnaudov has explained nothing wrong is supposed to happen to dogs 'participating' in it. Dog spinning – or trichane, as locals call it - is now practiced only in Brodilovo. In 2005, the foreign media found out about the tradition and the world was outraged by its cruelty. Bulgarian animal welfare organizations also stood firmly against it. Many of the folklore traditions of Southeastern Bulgaria dating back to pagan times are world-renowned for their uniqueness - such as the fire-dancing or nestinarstvo, which is practiced only in this region.